Mirage of the Saracen analyzes the growth of monasticism and Christian settlements in the Sinai Peninsula through the early seventh century C.E. 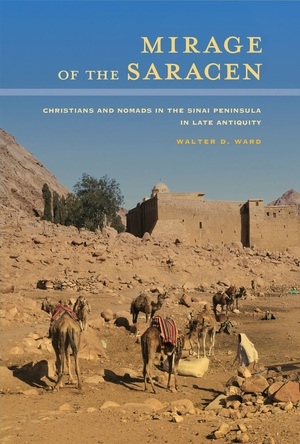 Walter D. Ward examines the ways in which Christian monks justified occupying the Sinai through creating associations between Biblical narratives and Sinai sites while assigning uncivilized, negative, and oppositional traits to the indigenous nomadic population, whom the Christians pejoratively called “Saracens.” By writing edifying tales of hostile nomads and the ensuing martyrdom of the monks, Christians not only reinforced their claims to the spiritual benefits of asceticism but also provoked the Roman authorities to enhance defense of pilgrimage routes to the Sinai. When Muslim armies later began conquering the Middle East, Christians also labeled these new conquerors as Saracens, connecting Muslims to these pre-Islamic representations. This timely and relevant work builds a historical account of interreligious encounters in the ancient world, showing the Sinai as a crucible for forging long-lasting images of both Christians and Muslims, some of which endure today.